isnw_ecpisnw_ecp Ben Dover, Inc. does it again....and it's about time! 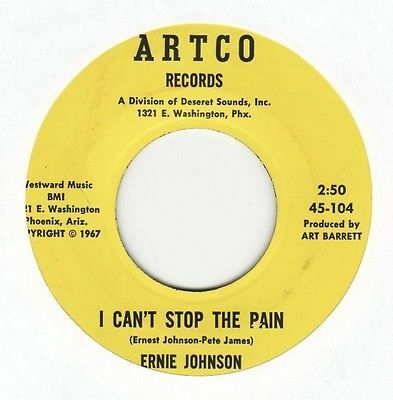 A superfine copy ofERNIE JOHNSON'S "I Can't Stop The Pain" b/w "These Very Tender Moments" on ARTCO #104. A Rare record on Arizona's legendary Artco imprint. Produced byArt Barrettat Audio Recorders of Arizona in 1967 and arranged by the late Prince Shell. At the top of most serious Northern Soul 45 want lists for many years. Very scarce. Only 300 pressed at the time. Ernie was half of the legendary Eddie & Ernie duo and this was his only solo recording. CONDITION: Visually vinyl is solid VG++/ M-. Looks unplayed. The labels are lovely VG++ (some light rubs one side-see scans). Plays with some light, occasional surface clicks & ticks, as when first pressed. There is a noticeablewarp in this particular copy as this record plays fine with normal weight. Thestylus moves gently up and down all the way through, but the record sounds great as you will hear above. You can hear samples both sides of the actual record you are bidding on above. NO RESERVE. GOOD LUCK!! See scan. This is a 45 rpm record. Check my positive feedback and bid with confidence. Satisfaction Guaranteed. $3.00 shipping in US!! Shipped to Europe, Asia, Japan & Australia via USPS Registered Mail for $20.00. Canada $10.00. Other International buyers should e-mail me to discuss shipping. Win multiple auctions and save on shipping. Paypal purchases are usually shipped within two days. If you have any questions, please don't hesitate to email me. Check out my other Arizona items currently for sale on eBay.